My dad ran every day when I was growing up. Weekdays, weekends, even when he wasn’t feeling so hot. Every day I saw my father configure his days around work, family, and his daily run. Subconsciously, I memorized his running routine. Part the kitchen curtain to squint through the window at the outside thermometer. Crack the back door open to get a “real feel” for the temps. Test the wind’s direction to then choose a route that saved the tailwind until the latter half. Mentally calculate the day’s layering system. Dress and put on shoes. Run. Upon return, my father would open up his desk calendar and note his overall miles for the day, the shoes he wore (so he could track the wear on them), and other details he found memorable. Simultaneously comforting and eccentric, I observed variations of this running ritual for years. Dad was a daily runner in a small Midwestern town during a time when such commitment to physical activity was fairly uncommon, and he was more than occasionally mocked for doing it. Not even public scorn would deter my dad from running. Other kids would ask us what was the deal with our dad and his running. We didn’t know. We did not understand his dedication or why running mattered so much to him, but my sisters, mom, and I all respected it. Over time, injuries took their toll and the run schedule relaxed to three or four times a week, mixed up with more walking. Dad still runs, just not like he used to do. I don’t think most parents are aware of their constant influence over their children. They know that, as parents, they are their children’s primary teachers, but I don’t think parents can fully anticipate what aspects of their own being and lifestyle are sinking in and how. They just hope some of their good habits stick. In recent years, I turned to running as one of my primary ways of maintaining and building fitness. My routine bears many similarities to that of my dad’s. I check the temperature on-line, and try to at least poke my head out a window before I layer up and pad away. If possible, I tackle the headwind first. I track my running miles in a paper calendar, although in a more streamlined fashion. While I still don’t know exactly what Dad’s run routine meant to him then or what it means now, I have some suspicions. 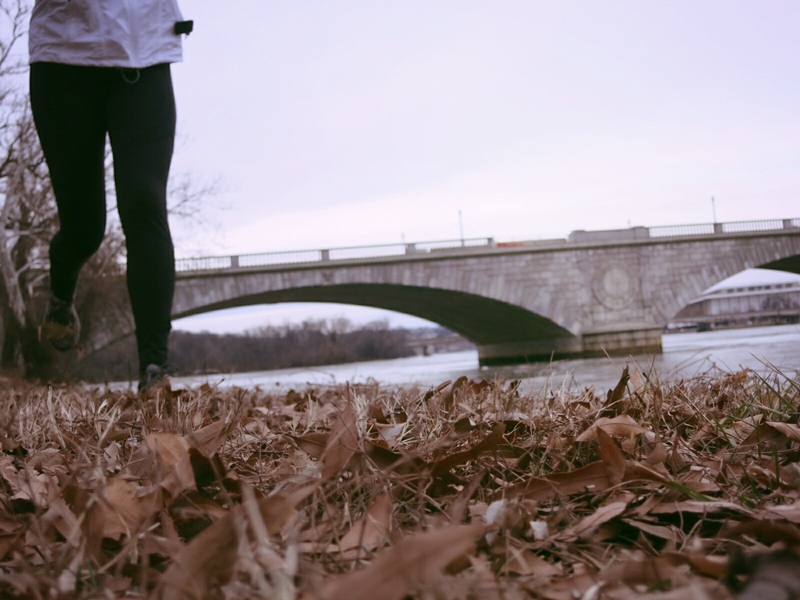 Running was his “me time,” one of the few times he could be alone with his thoughts, removed from the classroom or a house full of five people. It helped him stay trim and fit. Also a marathon runner, Dad met personal milestones through running. He never pushed any of his kids to run, and I don’t know that Dad ever meant to teach me anything or inspire me through his running. But over time this puzzling devotion to running compelled me to try it myself. Eventually I was hooked on my own version of the run routine. Like father, like daughter. I can only hope that my running example will somehow inspire my kids like your dad inspired you. So far it seems to be working. Engage them while they are impressionable because pretty soon they won’t listen to you, they will just watch your example. Sobering. My parents always kept usable bikes for all of us 7 kids and we would go on family rides somewhat frequently. (I went through a bike hating phase and I disliked this greatly most of the time.) But it was because bikes were always available to me that I started to view them as a form of transportation. That’s awesome! I guess it was similar for us, in that we always had a bike we could just hop on and ride if needed. I always took that for granted, but now I’m grateful. ahhh….so THAT is where you got your love for being active every day!! it looks good on you, and you are definitely inspiration for me! That is great. I have many a memory of my parents waking us up in the early weekend hours so we could go with dad to one of his runs. We did not think it was fun or even a good idea at the time, but now I have no problems heading out for an early weekend event myself.